Kaart met de zuidkust van Sicilië van Licata tot Augusta en zuidelijk tot aan Malta. Inclusief detailkaarten van Licata, Porto Palo, Siracusa en Valletta Grand Harbour en Marsamxett. A brand new chart for Imray dovetailing charts M30 and M31. M36 covers the South Coast of Sicily from Licata to Augusta and down to Malta. 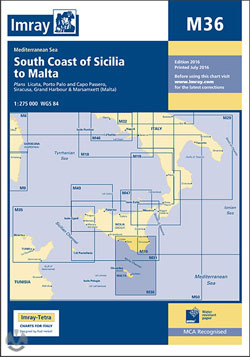 Includes plans of Licata, Porto Palo, Siracusa and Valletta Grand Harbour and Marsamxett. First published: July 2016, current edition printed: July-2016. The information shown on charts is liable to constant change. Corrections are made available on the Imray website.